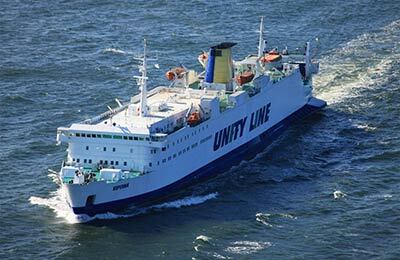 You can use AFerry to book a Unity Line ferry to from Sweden to Poland or from Poland to Sweden. Unity Line ferries are modern have a full range of on board facilities to make your journey a real pleasure. AFerry always has cheap prices for Unity Line and the latest special offers. 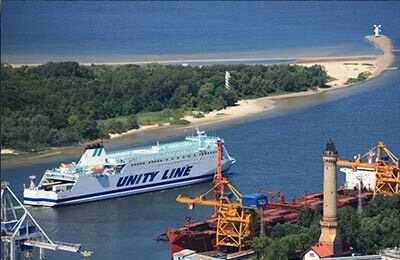 You can use AFerry to book Unity Line ferries from Poland to the port of Ystad in Sweden which is only about 50 kilometres to Malmö. You can also go from Ystad to the Polish town of Swinoujscie. See below for the latest Unity Line prices and sailing times. Click on your ferry route for a detailed Unity Line timetable with arrival and departure times. As well as a range of comfortable cabins and seating you will find plenty to do on board a Unity Line ferry. You will find full service a la carte restaurants as well as more simple self service bars for simple meals and light snacks. Shops selling discount goods, a bar where you can refresh yourself with hot and cold drinks and some ferries also feature a disco where you can dance the night away. Whether you use the Unity Line Ystad Swinoujscie route or if you go from Poland to Sweden on the Ystad Swinoujscie ferry, this Polish operator will ensure that your journey is nothing a pleasure. How long before departure should I arrive for Unity Line? Boarding begins 90 minutes before scheduled departure. Final boarding times are as follows: Foot passengers - 15 minutes before scheduled departure, Passengers with vehicles - 30 minutes before scheduled departure. Passengers with vehicles must be ready to load 90 minutes before scheduled departure. Ferry was good, cabin slightly more spacious than hull zeebrugge route, catering good, bars good and reasonable prices. Room clean, beds OK etc. I would recommend this trip although it does arrive pretty early. It was marvellous stepping onto the boat in Ystad. Suddenly one was in Poland with great service, really decent prices and a lovely journey. 7 hours worth for about the same as the Puttgarden/Rodby 45 minutes or the 20 minute Copenhagen/Malmo bridge. Brilliant. I arrived in Ystad by train from Stockholm via Malmö. It was raining so I didn't get to explore Ystad much. The ferry terminal is within walking distance of the town centre and railway station. On the ship, I had dinner in the restaurant then went to bed. I wanted to get a full night's sleep before the ship arrived in Swinoujscie at 0645. The cabin was comfortable. I didn't have breakfast aboard the ship. In Swinoujscie, I walked to the railway station where there are luggage lockers, then got the local free ferry across to the town centre. the trip with Unity Line was overall relaxing. a lot was due to the weather, since we were able to sit outside and enjoy the seaview. inside there were enough catering facilities but no good relaxing areas (to read or doze away). we would have been less comfortable if it would be cold and rainy. the dinner at the Casa Italia restaurant was excellent! the sea was calm but had it not been we would have appreciated our very well appointed de luxe cabin even more. Took a look at the basic cabins which were clean and functional. Catering from "white tablecloth fine dining" to a wide range of good value self service. 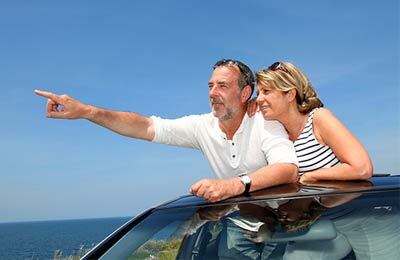 Everyone-kids, truckers and mature couples like us - seemed to be enjoying themselves. Blackjack,roulette and slot machines seemd popular. Swedes loaded up their cars with duty free booze. Embarkng and disembarking was efficient and speedy. Ystad is pretty but has limited accommodation but station with trains to Malmo is a short walk from the terminal.